The purpose of Carmelite life is precise. It is a life of prayer and sacrifice for the sanctification of priests and the salvation of souls. It is participating, sharing and assisting in priestly life. 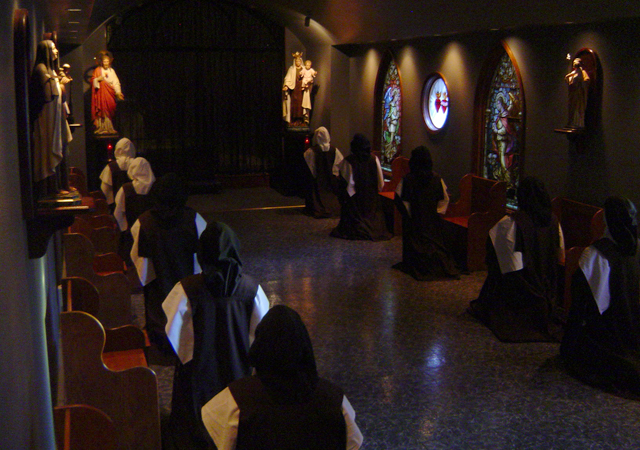 The work of the Carmelite nun is to labor for souls, to pray and perform penance for those who will not pray or do penance for themselves. Aware that this beautiful but demanding work is beyond our human power to accomplish, she humbly relies on God’s grace and merciful love to be her help. He never fails to guide and teach the sincere, generous soul who seeks only His will. All is done in a spirit of joyful simplicity. Our Holy Mother, St. Teresa of Avila, had no love for sad-faced saints and bequeathed to each of her Carmelite daughters a share in her own warm and gracious spirit of joy. The life of Carmel, though necessarily a life of labor and mortification, is most certainly also a life of the greatest happiness and peace. How can a sister not possess the deepest peace when God has given her the assurance of His love by bestowing on her such a beautiful vocation? Carmelites rejoice to live and work in His presence. 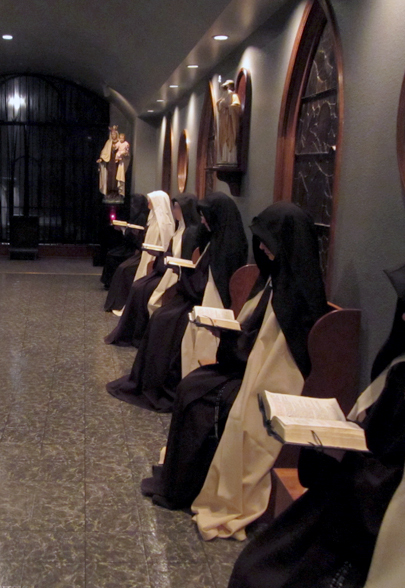 To pray without ceasing with the greatest possible perfection is a most important goal and duty of the Carmelite. The fasts, penances, silence and solitude enjoined by the Holy Rule are necessary if prayer is to be genuine and fruitful. These practices promote the spirit of recollection so greatly desired by the soul who has left the world in order to live in union with God. Jesus Himself desires to communicate and give Himself in love. It is His intention that this holy union with His Carmelite spouse bear abundant fruit in the souls of others. The times of formal prayer are the Liturgy of the Holy Mass (Tridentine Latin Masses) and the Divine Office, and two hours of mental prayer. Work time is no less prayerful than the time spent in the choir (monastery chapel). The entire day is marked by recollection and continual striving for holiness and perfection for love of the Divine Master. The solitude of the Carmelite is happily balanced with a loving community life through which she shares in the concerns, duties and joys of her family in Christ. She has companions in her striving for perfection, Sisters who help by guiding, encouraging and supporting her on her path up Mount Carmel. 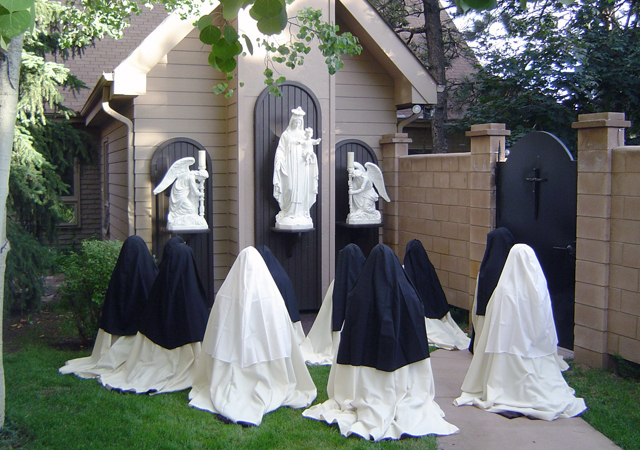 The strong bond, so characteristic of Carmel, is strengthened by daily recreation, during which the Carmelite enjoys the company of her Sisters in lighthearted conversation. All of the nuns perform their daily tasks and duties in a spirit of mutual charity and support with generous and sincere concern for the good of all. Each one shares in the day-to-day manual work for the needs of the Community. To Serve God Is to Reign! The vocation of a Carmelite is one of great joy. It is a joy that comes to those who know what a privilege it is to serve God in a humble, silent and hidden life. The Carmelite has great hope in the Sacred Heart of Jesus and in Our Lady of Mount Carmel, whose holy Habit she is privileged to wear. She lives according to the traditional Carmelite observance, endeavoring to answer with selfless devotion God’s call in these challenging times in the history of the Church and the world.